It’s also a dangerous time. Even in today’s fast-moving job market, where people are moving jobs every 18 months, your entire tenure will most likely be decided by your actions in your first 90 days. And those 90 days will be decided by your actions in your first few weeks in the position. I’ve always handled these transitions by the seat of my pants. Meet new people, check. Learn the product, check. Sign up for benefits, learn the company culture, start working and get my hands dirty. Check, check check. You can see how this process gets chaotic, fast. There’s lots to do, and lots to learn. Even though you’ve been hired based on your impressive resume and talents, the people in the new company don’t know you, and even if they’ve given you the benefit of the doubt, trust is always earned – or at least re-evaluated. The people in your new company will most likely give you a few weeks (at least) to start producing, but at some point they’ll start looking to each other, to your boss, and to your direct reports to understand who you are, how you work, and whether you can be trusted or not trusted. To succeed in a new position, I’ve realized that we need to be organized and intentional about how we go about the on-boarding process. Rather than going through a mental checklist, I’ve been putting my plan on paper, based on an excellent book that I recommend to everyone, ‘The First 90 Days.’ This book is a great explanation about why the first 90 days are so critical to your long-term success in any role, and it has great models and structures for organizing your time, understanding your strengths and weaknesses, and making sure that you’re using empathy to see yourself through other people’s eyes. So let’s start with the first week. What can you do in this first chaotic week to give yourself the foundation for long-term success in the role you’re in? You need to hit that band between action and listening/learning. Many type-A people fall prey to the action imperative, wanting to immediately put their stamp on the company. This is a mistake. To a person, you don’t know enough to make informed decisions that will play well over the long term. Early mistakes will lose you credibility, and you’ll spend your 3-6 months recovering rather than pushing forward in that time. On the flip side, some people wait for their bosses, reports etc to come to them. Don’t wait. Set an agenda, reach out and be active in your learning and listening. If you’re like me, then you’re a bit of an introvert. It’s a mistake to ignore the political and focus on processes, technical aspects of the job, etc. Every organization is made up of people, and that’s how any large project gets done. You need to have good relationships with the people around you. For some people it’s easy, but for me, my challenge is to never eat lunch alone. It’s way more fun to be connected, and you’ll build those all important relationships with the people around you. You might want to do this before you start, but it’s much easier in your first few days. As you understand the lay of the land, you’ll have a good sense about what you need to learn, and who you need to talk to learn those items. Your first quick wins the first week should involve housekeeping (signing up for benefits, getting tools in place), meeting people (go to lunch!) and importantly, setting up your plan for the next 90 days. What do I need to do in my first 90 days? You should buy The First 90 Days or check it out from the library. The short answer is 3-fold. You need to meet the people you’ll be working with 1-on-1. You need to understand the context in which you’ll be working – how the teams are organized, how decisions are made, the history of the company and of initiatives that you’ll be working on. For this step, you’ll need to make a list of what you want to learn, and what people to speak with to learn this information. And remember that it takes time – don’t try and rush this. The first week should be spent trying to figure out what, and how. The next few weeks and months you’ll be observing and listening to get the answers to these questions. The last part is setting up quick wins, so you can build momentum with the team you’ll be working with. Quick wins are easily-identifiable progress that slots nicely with the current direction of the company. Maybe it’s as simple as integrating yourself with a current project and helping the team meet their current goal. Maybe it’s a report on your learning about the current state of the company. Whatever it is, don’t fall prey to the ‘action-imperative.’ Don’t try and put your own stamp on something yet. You need to listen, understand and build credibility with those around you. I already have ideas about changes, ideas about how the company is structured and could change for the better. Previously, I would have internalized those as ‘the truth’ about the company and start work immediately to rectify those perceived deficiencies. A better way, I’ve realized, is to treat those ideas as a hypothesis that I keep to myself – and work to validate over the next 90 days. Your ideas will necessarily change, don’t let yourself get stuck in your first impression. Understand that they aren’t truth, but only perception. Validating these ideas will help you understand the way in which you perceive information, and make you less susceptible to the ‘action-imperative’ based on false information. I’ve included as an example some sections from my Google Doc that I set up to plan for my first 90 days – the questions I need to answer in my first few weeks, how I’m going to go about answering those, and some goals for weeks 1 and 2 so I can be sure that I’m meeting my milestones and getting some quick wins that will build momentum and credibility with the team around me. 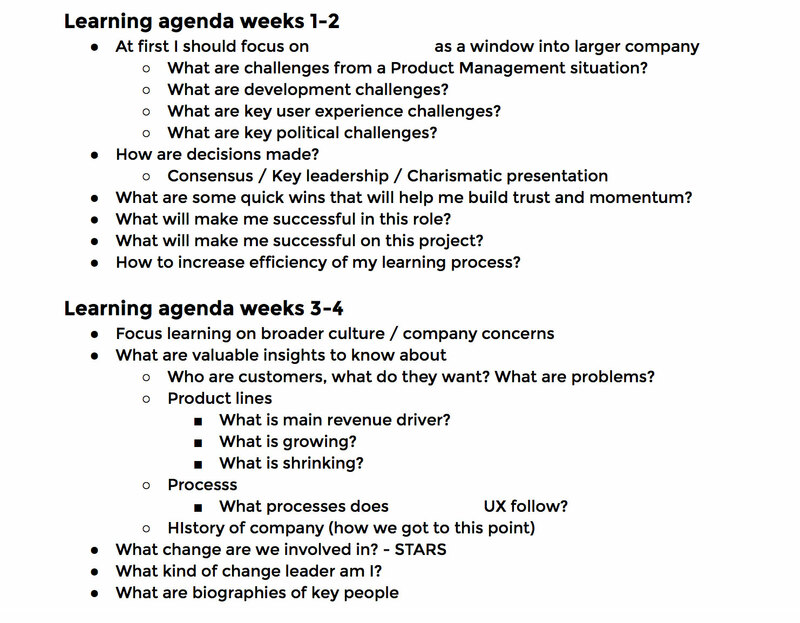 A learning plan helps remind me how I’m going to implement my learning agenda. It reminds me to keep my initial impressions to a hypothesis (rather thinking of it as ‘fact’). It also helps remind me to speak with people – I tend to focus on technical problems and ignore the political aspect. Plus, meeting and connecting with people is just fun, once you get over the initial stress of putting yourself out there (for introverts like me). I broke up my goals per week, to help keep me focused on the present. 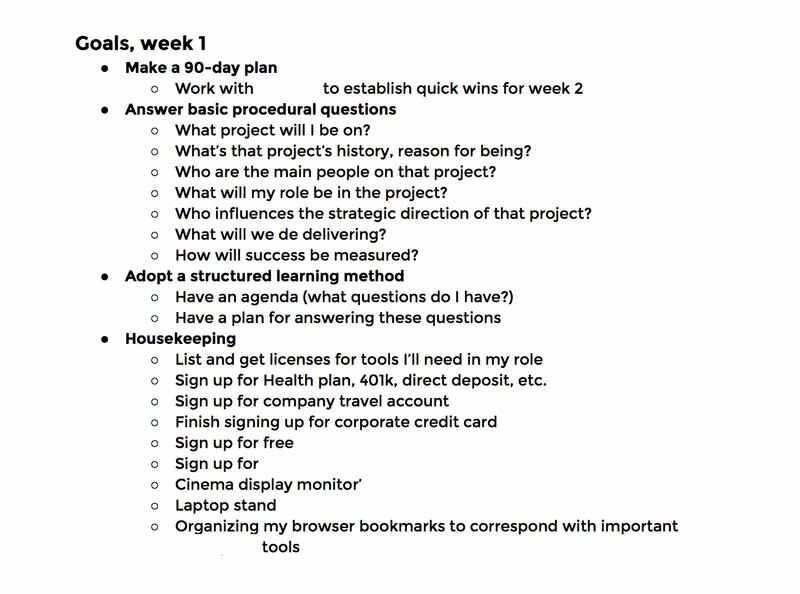 Week 1 is filled with basic information about people, projects and processes, creating my 90-day plan, and essential housekeeping stuff that could keep me from being successful in the following weeks and months.